3 March 2006 - George C. Tilghman, the last survivng member of the Killpack Crew took his Final Flight 01 March 2006. This crew was formed in Pyote, Texas. On Guam, they encountered the usual problems on practice missions to Rota- engine troubles and bomb-bay door malfunctions. Things went fairly normal until their 6th mission- Yokohama. It was a day raid so planes were in formation. Flak was intense and it was then that this crew's problems began to happen. A large hole was blown open just ahead of the tail position causing them to lose control and fall out of their formation. By throttling back engines 3 and 4, A/C Killpack and Pilot Neden managed to get their B-29 partially turned toward home only to be attacked by 12 Japanese fighters. The enemy was having a field day when suddenly a buddy Superfort appeared on the scene and proceeded to cover them. They limped out to sea, about 50 miles, and the crew bailed out. The tail gunner, Myron Williams, had been seriously wounded, so a rope was tied to his ripcord. But, it was to avail - the chute failed to open and he was never seen again. The second crewmember to bailout was CFC gunner, Joseph "Pete" Miller. 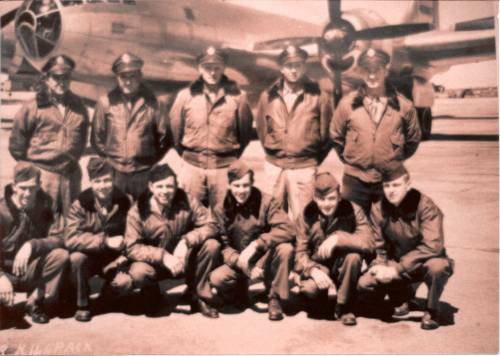 Others followed including George Tilghman, Left Gunner, and Flight Engineer, Fred Dunn, who who was the 8th man out. He watched the stricken bomber disappeared out of sight, but he never saw another chute. Airplane Commander Reece Killpack, Pilot Joseph Neden, and Bombardier Harry Collins apparently went down with their plane. As Dunn descended, he believed he was about to touch water and slid out of his chute. Bad mistake, as his parachute drifted away it took his life raft in the process and ripped half of his Mae West. So for several hours Sgt. Dunn floated half submerged with only a partially inflated life preserver. Fortuniately, the "USS Dragonet" eventually came along and pulled him out of the churning sea. Pete Miller and George Tilghman spent over 30 hours in the vast pacific exposed to some real nasty weather. As daybreak neared, Miller suddenly heard an aircraft but couldn't determine whose it was. It circled again, and as it passed directly overhead he could see it was a "Dumbo." Before bail out, Miller had hurriedly slid a flashlight into his pocket and with this he flashed the aircraft above. Immediately, a large searchlight scanned the oceans and framed him in its beam. Later, Miller heard that a Japanese boat situated between he and Tilghman had been sunk. They both speculated if others of their crew were aboard that vessel. The answer will never be known. Fred Dunn, George Tilghman and Joseph "Pete" Miller were all that would return from that mission. They spent five days on duty patrol and another eight days to reach Guam. After leaving patrol, their sub stopped dead in the water to pick up some other rescued airmen from another submarine. Suddenly, one of the vessel's radar men sounded a warning - TORPEDO ! ! ! Fortunately, it passed in front of them. When one of the crew was asked how near it had come, his answer was "Five feet plus." The attitude of the crew was - a miss is as good as a mile. When Miller returned to the 60th Squadron, he found that his clothes were missing - later he got them back. It had been reported that there were no survivors. Miller went on to fly as fill in on three more missions. George Tilghman was assigned to another crew and racked up another sixteen sorties. Fred Dunn also was assigned to another crew (Replacement Crew 52) and was in California at lead crew school when the war ended. He had more than one trying experience when his plane made a dead stick landing! There weren't many of these successfully accomplished with a B-29. Fred's luck held out, however, and there was no crash. In mid-September, Colonel Carpenter, CO of the 60th Squadron called Miller to his office and asked if he would like to return to stateside as scanner on baggage B-29. Miller gave a quick yes, immediately packed, and left the same day.